The lemon’s origins remain uncertain. A related fruit with far less juice, the citron, slowly migrated west until it reached Rome in the first few centuries A.D. Citrons were prestige items for the rich, prized for their smell, supposed medicinal virtues and ability to keep away moths. Emperor Nero supposedly ate citrons not because he liked the taste but because he believed that they offered protection against poisoning. One of the earliest references to lemons can be found in a 10th-century Arabic book on farming, and medieval Egyptians may have made an early version of the beverage. By 1100, documents suggest, Jewish traders in Cairo were selling and exporting a bottled drink called qatarmizat, which contained sweetened lemon juice. Lemonade made its way to Europe via the Ottoman Empire. 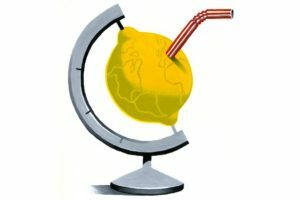 By the mid-17th century, Rome and Paris were vying with one another to become the lemonade capitals of the world. Vendors stood on street corners selling lemonade from tanks strapped to their backs. They became so popular in Paris that in 1676, the limonadiers were ordered to incorporate themselves into a guild. Around 1770, the theologian and scientist Joseph Priestley made Britain’s major contribution to lemonade by finding an efficient method of carbonating water. By the early 1780s, a German-Swiss jeweler named Johann Jacob Schweppe devised a new method, using a compression pump, that made quality mass production easier. By the early 1830s, the lemonade-stand business in Europe had been “disrupted” by the ready availability of Schweppes fizzy lemonade. But in America, the stand persisted. Hawkers in 1860s New York used dirty buckets to mix a cut-rate version of lemonade, made with molasses, and sold it to thirsty immigrants as they disembarked onto the docks of Manhattan. Lemonade selling stayed close to its poor, migrant roots until 1921, when Edward Bok, the popular editor of Ladies’ Home Journal, published his memoirs. His charming story of how, as a child, he made some of his first profits by selling lemonade in Brooklyn inspired parents to turn their children into young capitalists. But lemonade sales weren’t always so wholesome. In 1941, according to newspaper accounts, medical investigators traced a short-lived outbreak of polio to a girl’s lemonade stand in suburban Chicago. No one seems to have noticed that the cups were never rinsed. Lemonade endures as a symbol of American initiative and pluck. Warren Buffett has said that a lemonade stand taught him one of his first business lessons: He decided to put his stand in front of a friend’s house because there was more foot traffic there.